Sculling a Boat with a Single Oar. This isn’t the sort of sculling done using two, ridiculously long, oars to ‘row’ a long skimpy scull. This is the sort done with one oar, waggling it backwards and forwards over the transom. Ok, there is more to it than just waggling the paddle. Yes, it does take a bit of practice but this is a skill well worth acquiring. This is a handy way to propel a dinghy through a crowded anchorage, not only can you face forward to see where they're going but steering is easy. It is also an efficient way to move a sailboat when the wind has dropped or any boat if the engine is playing up. I first became intrigued with this method of propulsion when I saw large, heavy, traditional, French fishing boat being sculled out of the anchorage on Les Îles des Glénan. When you are sculling you are exerting the propulsive power slowly and continuously making it easier to move large loads relatively easily. If this is something you are thinking of doing with a light dinghy over short distances then a normal oar can be used quite adequately, preferably one which is at least two thirds the length of your boat. However, there are several designs of paddle shaped especially for this technique which are easier and less tiring to use. Perhaps the best known is the Chinese Yuloh. Specialist sculling oars usually have longer shafts and longer blades than a rowing oar. And more important they are angled so that virtually no wrist rotation is required. The yuloh is usually made from two or three straight pieces set at an angle so the blade curves down into the water at an angle of about twenty five degrees. The long blade should be shaped so that it is flat on the bottom and curved on top. When used with the flat side down the oar reverses pitch easily at the end of each stroke. The Chinese also attach a rope from the handle end down to the deck. While this helps keep the oar from digging too deep, it is mainly used to help twist the oar and assist the sideways pull. A deep oarlock will make sculling much easier for the novice as it will help overcome the beginner’s tendency to allow the oar to jump up out of the rowlock, some even use a captive rowlock or a rope tie-down. If you watch an expert, sculling looks easy. However there is a knack to it which requires patience and practice to get it right. and where you start with it flat. Both methods use the same basic principle. The oar blade is swept back and forth across the stern with the leading edge always angled downwards. For the beginner and anyone using a standard oar the first method is the easiest to master (which is why I do it this way). This vertical or slalom stroke also makes it easier to steer the boat and there is less tendency for the oar to jump out of the rowlock. 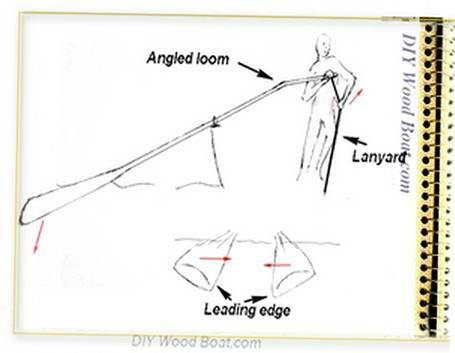 With this method the lower edge of the oar blade always leads. So start with the blade vertical then use your wrists to turn the oar blade then push it so that bottom edge is leading. 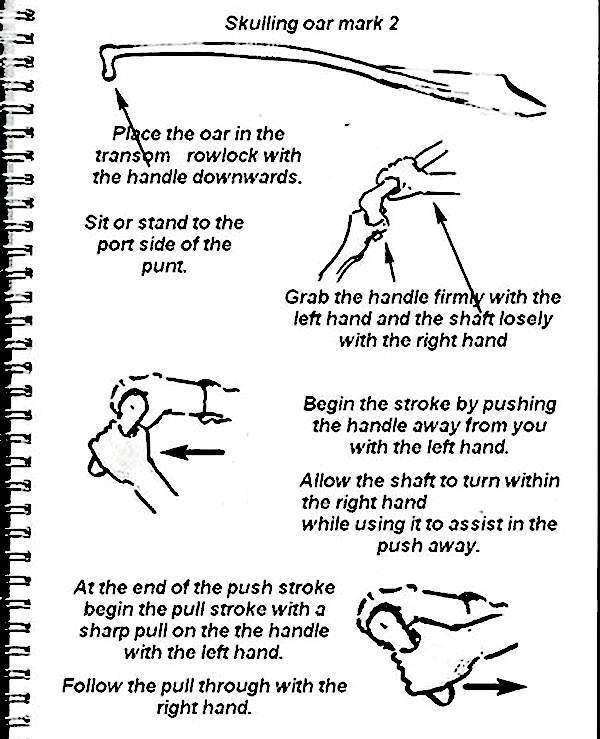 At the end of the stroke reverse the twist so that the bottom edge is facing the opposite way then begin the reverse stroke. To begin with just use a small amount of twist until you become more adept at reversing the pitch at the end of the stroke. As you get more confident begin to give the blade more twist so you get more forward momentum and less zigzag. With practice, you'll find that you can steer by varying the pitch on alternate strokes. 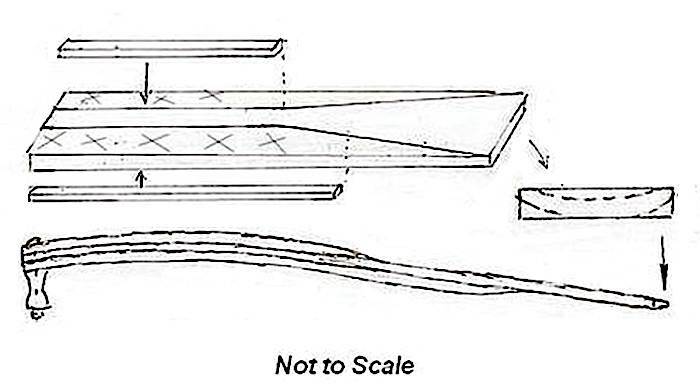 The second method with the blade starting in the horizontal position is the one most commonly used with a specialist oar. 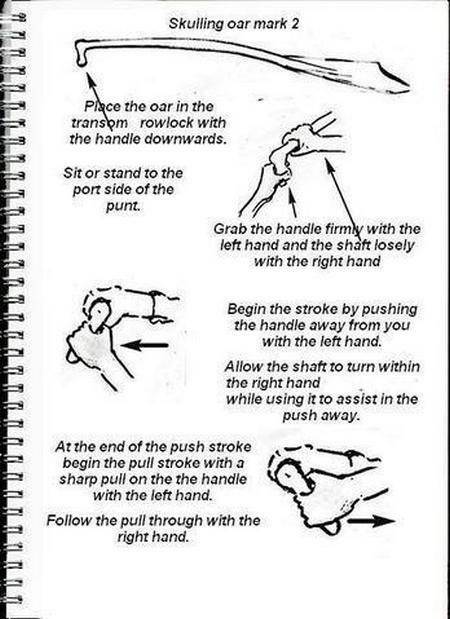 This is a much more powerful and efficient stroke. The stroke begins with the flat side of the blade facing down. It is then twisted and the lower of the edges is always the leading edge as you push from side to side. With either method, the pitch of the blade must be changed as the direction of thrust is altered otherwise the oar will come out of the water. With the Chinese yuloh, one hand holds the oar end at head eight while the other hand uses the lanyard to move it from side to side. The yuloh’s lanyard also puts the required twist on the oar so little or no wrist action is required to put the pitch on the blade. Sculling is not as fast as rowing, however it is a skill worth learning. It is a handy way to thread your way through a crowded harbor or narrow creek. And it is an easier way to move a heavy boat in an emergency. All it takes is a little bit of practice. Below is how the paddle is used. It is an easier way to move a heavy boat in an emergency.